we are utilizing the whole plant as it is meant to be utilized. The difference between an infusion and a concoction is the length of time it must brew due to the density of plant parts utilized. Infusions are made from the more delicate and aromatic parts of the plant: leaves, flowers, buds; some berries and seeds. Decoctions are made from some berries, seeds, bark, stem, rhizome and root. 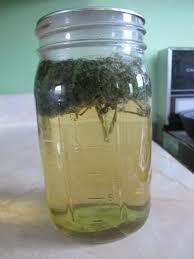 Generally: Use 1 part coarsely ground Dried HERB, or 2 Parts Fresh Undried HERB to 20 parts Boiling Water. 4. Cover tightly and let stand for 20 to 30 minutes in a warm place. 5. Strain and press out the marc (dense stuff). 6. Add enough water to make the infusion measure 1 pint. Remember, you can add other ingredients to make your infusion pleasant to taste. In most cases, want to hydrate as well as medicate. The dose will be taken as several cups per day. Additive examples are: Honey; Lemon/Orange Zest; Anise, Cardamom and Coriander Seed; and Cinnamon.